Amanti Art, online at amantiart.com, offers unique framed art prints to complete your living space. Amanti Art lets customers choose prints in a variety of styles and collections, including vintage art, abstract art, museum masters art, Picasso prints, Van Gogh prints, photography, and much more. Amanti Art also allows customers to crop images, customize sizes and glazing, and choose the mats and frames of their choice. Additionally, Amanti Art is committed to helping customers save money on beautiful and inspiring all decor. But before you shop, get all the latest amantiart.com discounts, Amanti Art promotions, and Amanti Art coupon codes found here at RetailSteal.com. Amanti Art delivers within the United States, APO/FPO addresses, and to Canada. Amanti Art offers a free ground shipping option for orders within the United States. See site for more information. Enjoy 50% savings on framed wall art from Amanti Art. Click link to shop and save. Amanti Art offers free ground shipping on purchases delivered within the United States. Click here to shop. 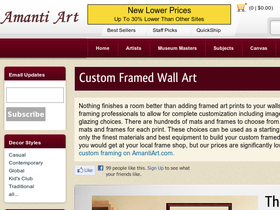 Amanti Art offers framed wall art and prints for 30% less than other framed art sites. Click here to save. Get a 25% discount on your first purchase from Amanti Art when sign up for updates. Click link to get started now. Enjoy prints from as low as $45 from top artists like Picasso, van Gogh, Gustav Klimt, and others from Amanit Art. Click here to shop. Shop at Amanti Art for custom vintage prints starting from only $45. Shop now and enjoy. Enjoy the beauty of Claude Monet art at home with prints starting from $45 at AmantiArt.com. Click here to shop. Shop at AmantiArt.com for kids' wall art from as low as $40. Click here to shop. Customize the size, cropping, mat, and frame from Amanti Art. Click here to create your own wall decor.